8.3b metric tonnes of plastics pollute the world – Royal Times of Nigeria. Scientists have warned that our planet risks near permanent contamination of the environment by plastic pollution, with a staggering 8.3 billion metric tons of plastics produced since the 1950s. A study led by a team of scientists from the University of Georgia (UGA), the University of California, Santa Barbara (UCSB) and Sea Education Association, is the first global analysis of the production, use and fate of all plastics ever made. As of 2015, humans had generated 8.3 billion metric tons of virgin plastics, 6.3 billion metric tons of which had already become waste, according to the study published Wednesday in the journal Science Advances. In other words, the amount of plastics produced is as heavy as 1 billion elephants or 822,000 Eiffel Tower, according to the study. Of the total plastic waste, only 9 percent was recycled, 12 percent was incinerated and 79 percent accumulated in landfills or the natural environment, the study showed. “Most plastics don’t biodegrade in any meaningful sense, so the plastic waste humans have generated could be with us for hundreds or even thousands of years,” said Jenna Jambeck, study co-author and associate professor of engineering at UGA. A world without plastics seems unimaginable today, yet their large-scale production and use only dates back to the 1950s. Global production of plastics increased from 2 million metric tons in 1950 to over 400 million metric tons in 2015, according to the study, outgrowing most other man-made materials. If current trends continue, roughly 12 billion metric tons of plastic waste will be in landfills or the natural environment by 2050, according to the study. “What we are trying to do is to create the foundation for sustainable materials management,” said Roland Geyer, lead author of the study and associate professor in UCSB’s Bren School of Environmental Science and Management. 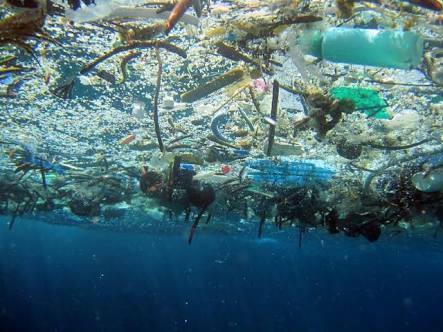 Plastic debris has also been found in all major ocean basins. The same team of researchers estimated in a 2015 study that 8 million metric tons of plastic entered the oceans in 2010.